West Bengal Police is going to recruit fresher candidates in India for Sub-Inspector of Excise Posts. So, those candidates who are willing to work with this organization they May apply for this post. Last Date of Apply 04-March-2018. Total numbers of vacancies are Not Mention. Only those candidates are eligible who have passed Bachelor’s degree in any discipline from a recognised university or its equivalent. 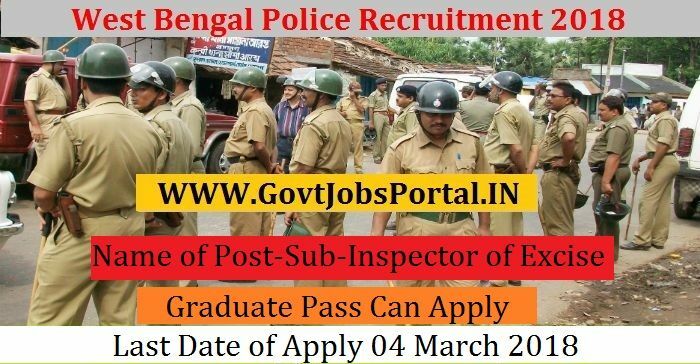 Indian citizen having age in between 20 to 27 years can apply for this West Bengal Police Recruitment 2018. Educational Criteria: Only those candidates are eligible who have passed Bachelor’s degree in any discipline from a recognised university or its equivalent. 1: Selection will be held on Preliminary Written Examination. 3: Selection will be held on Personality Test.